Security cameras improve commercial property protection. According to the Electronic Security Association (ESA), almost 60 percent of criminals consider the presence of cameras when selecting a target, and over 40 percent will choose other targets if they know they’re being watched. This is good news for businesses, especially when combined with technological advancements that empower cost-effective, reliable options such as outdoor wireless cameras, virtual guard monitoring systems, and HD digital recording. The challenge? 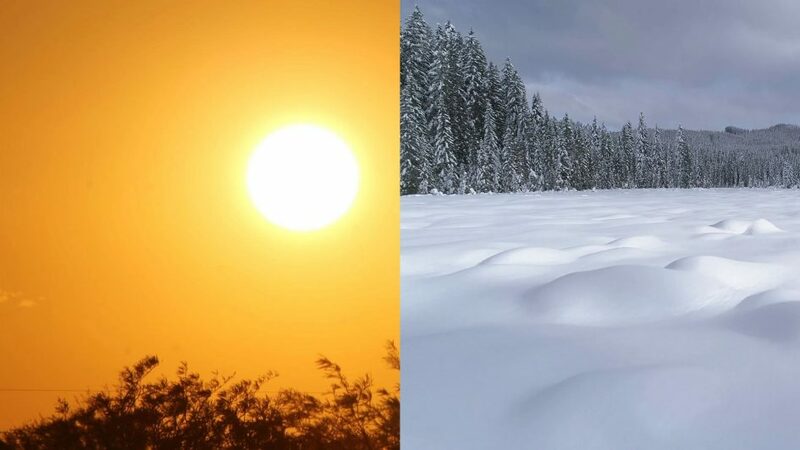 Ensuring your outdoor cameras are up to the task of handling extreme weather — even 24 MP, ultra-HD cameras can’t offer protection if they’re overheating, freezing cold or sopping wet. Here’s what you can do to weatherproof your outdoor cameras for extreme conditions. If you’re running an auto dealership or construction firm located in the northern U.S. you know the winters are long, dark and unforgiving. Blowing snow mixed with frigid temperatures keep all but the hardiest souls inside — and while most criminals opt out and wait for warmer temperatures, some enterprising evil-doers recognize the inherent potential of inclement weather: If it gets too cold, outdoor wireless camera systems may not work as intended or may not work at all. What can you do to protect your cameras from extreme cold? First, reduce their reliance on traditional power sources, which can easily fail during winter months. Instead, leverage solar solutions as either primary or backup power to ensure continuous operation. Next up? Consider the type of camera you’re purchasing. Many manufacturers now offer temperature ratings as part of their specifications, allowing you to choose devices that can handle local climates. Built-in heaters are also gaining popularity as a way to keep wiring and other components from freezing solid during local cold snaps. Also critical? Your outdoor security camera installation. Wherever possible, install cameras where they’re protected by some building or landscape features, or consider building a dedicated enclosure to limit exposure. In some states, commercial properties escape brutal cold but must contend with drenching rain. And given the highly sensitive nature of IP camera parts, regular soakings aren’t ideal for continued operation. Here, protecting your security assets means starting with the right equipment: Look for heavy-duty outside cameras that are clearly marked as “waterproof” — while indoor/outdoor alternatives are often cheaper and may survive less-than-average rainfalls, consider the risk if cameras suddenly cut out during an attempted burglary. Also a good idea? Finding the right placement for cameras that will endure significant amounts of rain. Start by taking a walk around your property during a rainstorm. 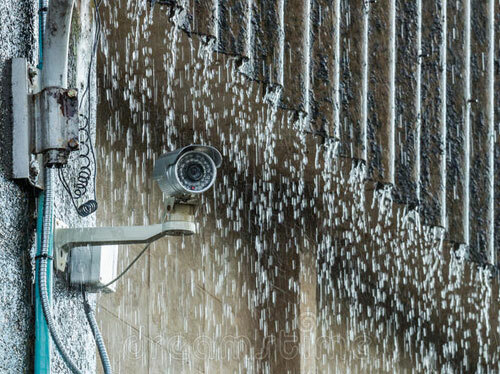 Note where water runs down roofs, overflows eavestroughs or funnels due to building construction and avoid placing any cameras near these areas. While this may impact ideal line of sight, it’s better to spend on two outdoor wireless cameras for reliable coverage instead of opting for one that only works occasionally. For companies doing business in the bright sunshine and rising mercury, cameras face another problem: Overheating. 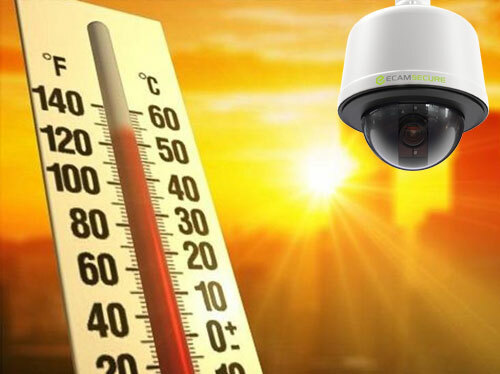 Most plastic and metal components in IP cameras encounter issues when the temperature climbs north of 100 degrees — this is especially problematic for large-scale commercial operations such as construction sites and car dealerships where acres of flat land limit the amount of available shade. The solution? 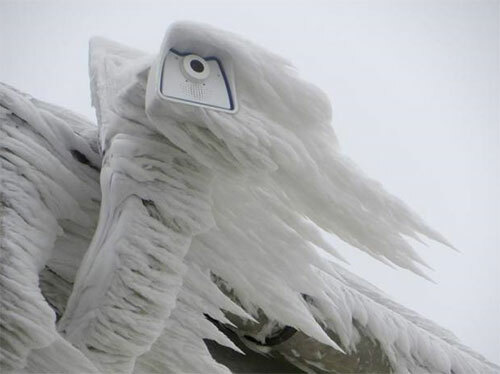 Some cameras are now available with built-in coolants to help offset the impact of rising temperatures, but the right outdoor security camera installation approach can offer improved long-term results. Look for companies that offer complete design, installation, and maintenance services since they’re best-served by installing cameras in ideal locations which limit the total amount of service required. If you do opt for self-installation, shade is your goal. Avoid having a west-facing camera wherever possible to eliminate the problem of full-day sun exposure. Outdoor security systems are an effective crime deterrent, provided they’re in working condition. Limit the chance of extreme weather issues by purchasing the right type of camera for the job, identifying ideal placement locations and leveraging the expertise of a full-service design and installation security firm. No matter what your security needs, eCamSecure has what you need. Contact us to request a quote.